Yellow is the color of the sun. It’s bright and cheerful. Lemon – Lemons are full of vitamin C. To incorporate lemons into your daily routine you can add a wedge to a glass of water, add it to your juice, or in muffins. Banana – Most people know bananas have potassium but they’re also rich in vitamin B6, vitamin C, and fiber. Bananas are delicious raw. If your bananas are browning use them in banana bread. 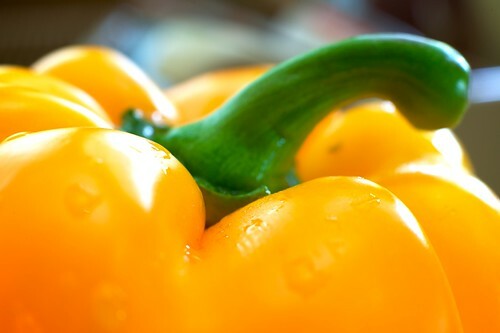 Yellow bell pepper – Yellow bell peppers have vitamin A, vitamin C, and folate. Add peppers to a stir-fry, roasted, or eat raw with hummus. Pineapple – Pineapples are a delicious fruit that provides manganese and thiamin (vitamin B1) which help with antioxidant defenses. Pineapples are an easy addition to juice or a fruit salad. What are your favorite yellow foods and yellow food recipes?